What's Worse than a Casino? John Carroll, dean of the Cumberland School of Law at Samford University, said the number of lawyers doesn't surprise him. "It's because of the complexity of the case that there are that many lawyers in it," Carroll said. "It's a complex case involving so many moving parts." I created the charts out of curiosity. 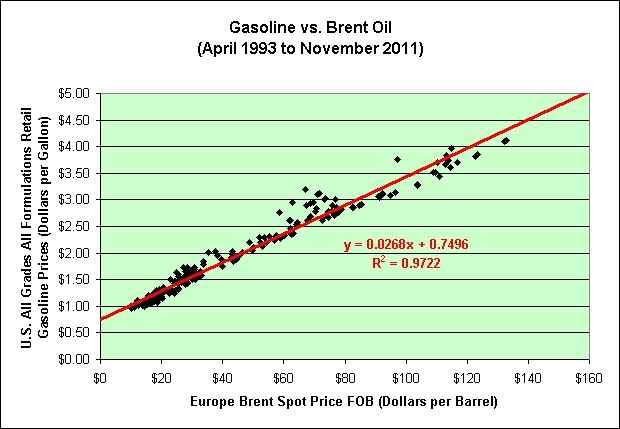 What would it take to see $5 gasoline at the pumps? 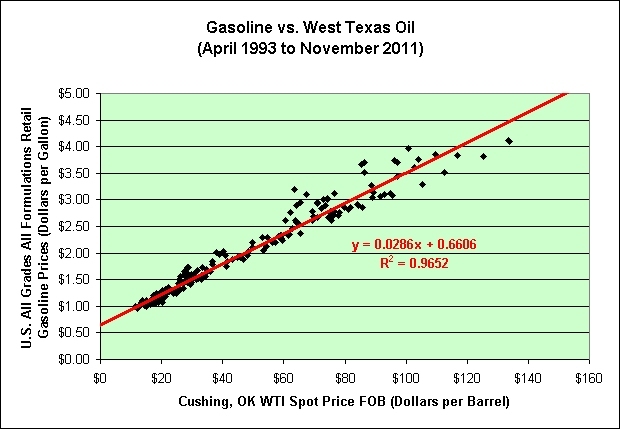 It looks to me like a sustained $160 oil level could do it. If I had to guess (and I assure you that's pretty much all it is), I'd say the global economy can't even handle $100 oil though. Time will tell. It's certainly trying to stick at $100. I'll give it that. Keep in mind that although I have been leaning deflationary, the bulk of my nest egg continues to sit in long-term TIPS and I-Bonds. This is certainly not investment advice. I think you can see my level of certainty here. 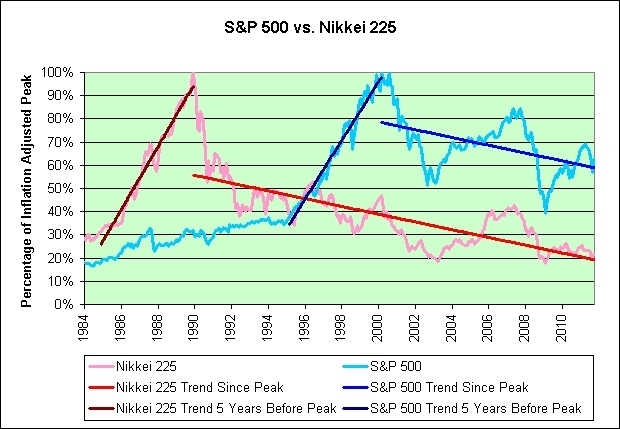 I continue to lean short-term deflationary but want the long-term inflation protection just the same. Ten years ago, top economist Wu Jinglian criticized China's stock market as a place worse than a casino because of its excessive insider trading and market manipulation. "At least there are rules in a casino," he said. Not much has changed in terms of protecting small investors' rights. As wealthier people quit stocks to buy property instead, the stock market has become a casino only for the poor, who cannot afford to speculate in real estate, as Andy Xie says. Savvy Chinese Find Market Top! (Reuters) - Sears Holdings Corp will close as many as 120 of its Kmart and Sears discount and department stores after its holiday sales slumped, sending its shares sliding more than 27 percent to their lowest level in three years. What's a CEO to do these days if he can't report financial information and he can't hide financial information? That's sure some conundrum! In the comments, Anonymous felt that we were joking. I can understand the confusion. We often joke in the comments. I can't believe the previous comments are supposed to be taken seriously. First off, Eddie Lampert was recognized as a whiz a decade before buying Kmart. Second of Lampert is still a whiz his return on Kmart and on Sears even with the recent decline beats the market hand over fist. In all fairness, there's still 6 1/2 years to go on that fantastic investment. 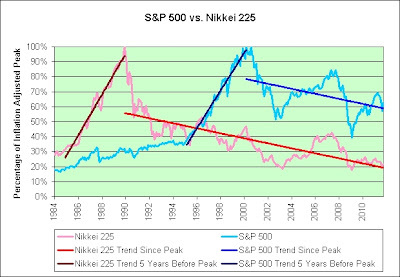 If it triples from here, then hindsight will will show that it was every bit as good as buried cash. Woohoo! Special thanks to Credit Bubble Stocks for posting about Sears today. I would have missed today's 27% decline without it. There’s no economic rebound to prosperity, but it will continue to be a better environment than it was in 2008, 2009 and 2010. 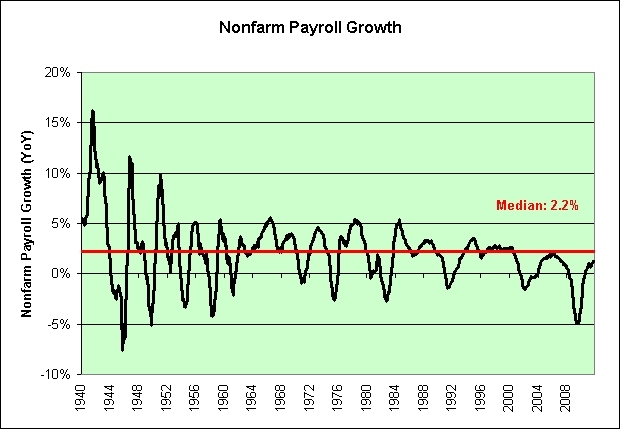 The economic rebound to prosperity theory is an illusion? Shocking! Restaurants will benefit from pent-up demand. Two out of five American adults said in a recent survey that they are not using restaurants as often as they would like. Similarly, the ice water business will benefit from pent-up demand. Five out of five dwellers of hell said in a recent survey that they are not drinking ice water as often as they would like. I tease. Let's try this again. How many Americans are using restaurants more than they would like? I don't mean to be alarmist, but it could be as many as three out of five. Holy @#$%! Never a better time to invest in restaurants or start your own! “Miniaturization,” or the continued growth of small plates, snacks and downsized portion options, which have been driven by price sensitivity, consumer interest in sampling, grazing or sharing, and health concerns. I am addicted to Rocksmith. It fully explains my lack of posts lately. It also explains a few calluses on my fingertips, lol. Since I wasn't that clear in my last post, you actually use a *real* electric guitar to play this game. It comes with a cable to hook your own electric guitar directly into the Playstation 3. How cool is that? I'm not as good as the person playing in this video but I'm getting better every day. Baby steps! Technology is a wonderful thing and this game is nothing short of miraculous. In my opinion, this is what real prosperity looks like. It has made learning the guitar very enjoyable. Merry Christmas everyone. May you all find real prosperity this season and well into the future. 1. The hands and feet are symmetrical. 2. The head is asymmetrical. If you look at the heads, the figures must spin. Your brain will force the issue no matter how hard you try. If you cover up the heads, the bodies can either spin or move back and forth. Your choice. This is the part that I find interesting. When looking at the heads, the brain knows they must spin. When the heads are "covered up", the brain clearly still knows they must spin but no longer cares. The expression is usually applied to people in positions of authority who abuse their power to avoid or silence criticism or to deflect guilt of wrongdoing. Those who initiate a cover up (or their allies) may be responsible for a misdeed, a breach of trust or duty or a crime. No wonder we are such easy targets for the spin doctors. The NAR has characterized this as "drift", but this shows a fairly sharp downward revision to 2007 data. Since we know the National Association of Realtors is completely unbiased and made up of only the most ethically responsible business professionals, we can only assume that the odds were split evenly between being a downward revision and an upward one. Further, let's turn 5 years worth of 14.6% inadvertent mistakes into opportunities! Fine Print Disclaimer: If I seem biased, it is only because I don't want to ever ruin my chances of becoming the next Chief Economist at the NAR. David Lereah and Lawrence Yun are my heroes! The company said in its bankruptcy filings that Hurricane Katrina and the economic downturn that began in 2007 were significant setbacks for its business. Sounds crazy but it might just work. Is this compatible with #1? What if someone works a second part-time job? Show the math! I need proof! Whew! I was starting to think I was wasting my time by reading this article. If you have the money to afford early retirement then you can afford early retirement? Genius! If less money is spent in retirement then less retirement money is needed? Who would have guessed? If more money is saved then the sooner one can retire? Is this compatible with #4? What if one saves more *and* spends less? Sounds confusing. Is there some place I can turn for even more details? For more information on how to retire early consult your financial advisor. 1. How can the financial advisor retire early when there is so much awesome free financial advice being generated on the Internet? 2. Has the financial advisor given any thought to doubling fees in lieu of finding a second job? Talk about win win! 3. Other than paying a modest fee each time I ask a question and/or offering him/her a small percentage of my nest egg, what else can I personally do to help the financial advisor retire early? The following chart shows the month over month change in the seasonally adjusted consumer price index over the last 5 years. Hyperinflation theories are being poned yet again. A consistent 0.2 on the chart would yield 2.43% annual inflation. That's pretty much what we've been getting, give or take. 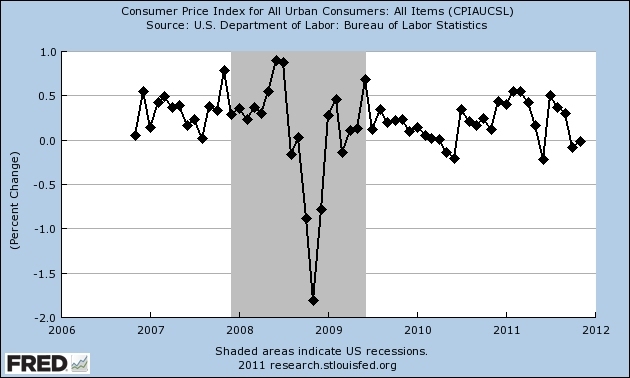 Average annual inflation rate over the last 5 years has been 2.34%. 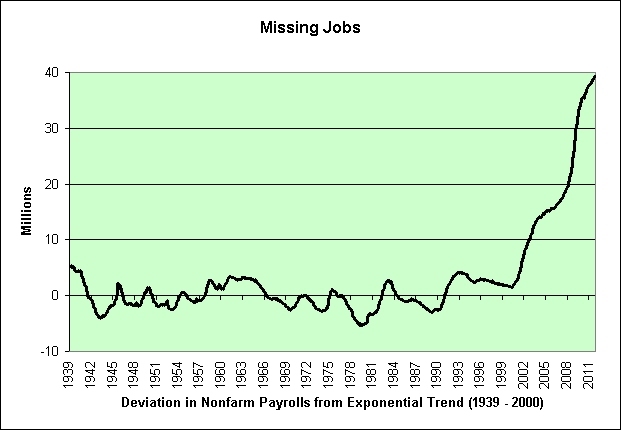 Other than the deflationary event in 2008, there's really not much to see here. Further, three of the last six months were below 0.2% and three were above it. So what does this mean? Holding EE Savings Bonds still seems okay to me. The mispricing may be worth the risk. I've been a reluctant buyer for the past two years and will probably be so again in 2012. No complaints so far. I'm thinking that three purchases in three years qualifies as the beginnings of a bond ladder. Go figure. 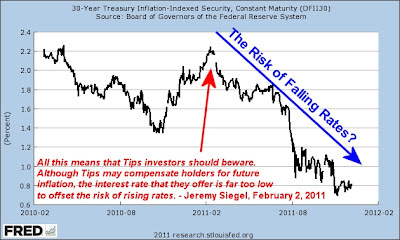 That said, I still prefer TIPS and I Bonds for their inflation protection. EE Savings Bonds are a very small part of my nest egg. Here's the premise. Let's say that you are a saver and wish to own inflation protected treasuries for 30 years. What's the optimal way to play the yield curve? 1. You could buy the 30-year TIPS and just lock in the 0.73% real yield. Little math needed. You know what you get. 2. You could buy the 20-year TIPS and earn 0.53% for the next 20 years. You'd need to earn 1.14% per year for the remaining 10 years to match the return of the 30-year TIPS. 3. You could buy the 10-year TIPS and earn -0.04% for the next 10 years. You'd need to earn 1.12% per year for the remaining 20 years to match the return of the 30-year TIPS. 4. You could buy the 7-year TIPS and earn -0.42% for the next 7 years. You'd need to earn 1.09% per year for the remaining 23 years to match the return of the 30-year TIPS. 5. You could buy the 5-year TIPS and earn -0.74% for the next 5 years. You'd need to earn 1.03% per year for the remaining 25 years to match the return of the 30-year TIPS. Only hindsight will tell us which option was best. Options 2-5 do require higher real yields in the future (between 1.03% and 1.14%). They may come. They may not. Not only is the bond market suggesting that the next 5 years will treat savers poorly, it isn't exactly predicting great things for the 25 years that follow either. I think the bond market is pretty much in line with my own predictions at this point. For what it is worth, I think the death of real yields has probably run its course. For all intents and purposes, real yields are now dead. That doesn't mean that I expect rates to move higher from here. I don't. If I had to guess, I'd say rates will stagnate (to match our economy). Could be wrong of course. It is just a guess. 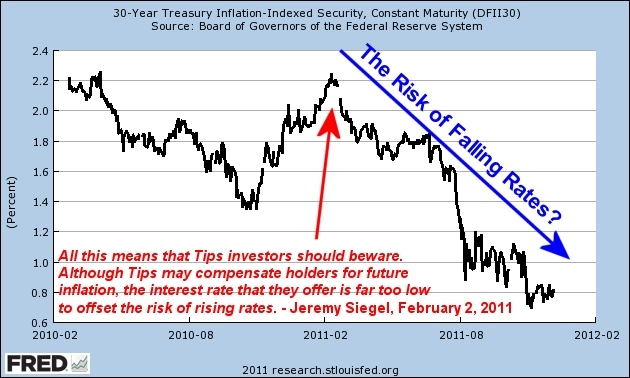 And lastly, let's go back in time to when Jeremy Siegel warned us not to buy TIPS. Oops. In hindsight, 2.10% in the hand was worth more than today's 0.73% in the ivory tower. Who knew? Now savers (and pension funds?) are praying for 1% real yields. Well, there's always hope. It dawned on me this morning that I was doing a terrible disservice to my readers. The ongoing Rubicon joke is very nearly back in play but there is a serious issue with my methodology. The Rubicon joke was based on a number pulled directly out of thin air. I aim to rectify that situation today by offering a solid objective estimate of the true Rubicon level using daily S&P 500 data from 1998 to present. Hindsight shows that the Rubcion was 1197.8 on January 3, 1998. It is currently 1186.7. That's roughly a 1 point decline per year. It is also 1% less than the 1200 level I have been actively heckling. Shame on me! I clearly did not factor in its degradation over time. When one is using 20x to 30x leverage in order to make easy money, a 1% discrepancy could mean billions of dollars in lost profit potential. I apologize for any inconvenience that my earlier ballpark Rubicon estimate may have caused. In my defense, how could I have possibly known that the S&P 500 wouldn't return to 1500 and therefore pull the trend line up again? All we'd need is another bubble to replace the recent housing bubble and the earlier dotcom bubble. How hard could that be? Poser lingo for the internet slang word 'pwned' as in being owned or disgraced by someone else. Contrary to the opinion of shadowstats and as seen in the following link, hyperinflation is not yet upon us. In response to my query, several posters discussed the sad state of affairs for cash holders. Konodrum quipped, "I bury cash or stuff it in the mattress. Ziploc bags do well." FidlStix is also keeping his sense of humor, even as he acknowledges that the landscape has become a challenge for retirees and anyone else attempting to wring a return from low-risk assets. "I recently went to my local hardware store to buy two stainless-steel buckets for my shorter-term retirement needs. I prefer stainless because it's practically corrosion proof and stays shiny longer. Sadly, all they had were cheerless, gray galvanized buckets with holes in the bottom." Think about this for a moment. People are joking about buying containers to store money. That's not what one would expect to see during hyperinflation. I'm a fan of Ziploc bags. I hoard them. It isn't because I'm all that worried about hyperinflation. I just think they will perform better than buried cash and/or short-term treasury bills over the long-term. Ben Bernanke has encouraged my hoarding/saving behavior by keeping short-term rates at 0%. I have therefore brought future purchases of basic necessities into the present. 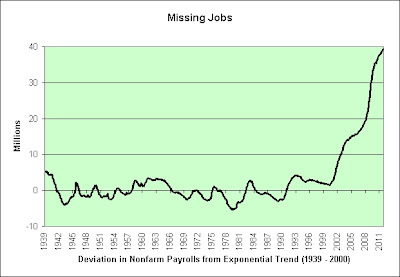 If the goal is to make the current economy better and the economy of the future worse, then mission accomplished. It's not like I will be buying more Ziploc bags overall. I have simply altered the timing of my purchases. That's all. I'm pretty much done buying Ziploc bags. I have about all I will ever need. I'd like to think that I am at least as smart as a squirrel but I will admit that it is open for debate. I'm serious. As seen in the link, I have not scattered my hoard. But hey, at least I have a hoard. In the eyes of a squirrel, surely that's better than doing nothing. So why aren't more people doing it? Compulsive hoarding (or pathological collecting) is a pattern of behavior that is characterized by the excessive acquisition and inability or unwillingness to discard large quantities of objects that would seemingly qualify as useless or without value. That's just nuts! Is it any wonder that hoarding got a bad name? Do the items in the picture look useless or without value? The return on garbage bag investment is now 35.8%. Fortunately, nothing else in the picture is even close. Inflation has been mostly tame. It's almost like garbage bags are special (made of petroleum products). Come to think of it, so are Ziploc bags. Restaurant Expert Witness, Restaurant Consultant, and CEO, Howard Cannon, says, "Hire the best lawyers and accountants you can afford. They are out there and the great ones are worth every penny. A lot of people are trying to save money when they start a restaurant, but many make the mistake of choosing to use no lawyer at all because they think they can get what they need from some sort of website." I've been giving some thought to opening a new restaurant. This article really sealed the deal for me. I am going to hire a plethora of the "best lawyers and accountants" that money can buy and use any remaining nest egg to secure a loan to partially fund my new business. I figure if I come up a bit short, I can always just sell my house and live right on the premises of my new restaurant business. Prosperity, baby! That's what I'm talking about! Fine Print Disclaimer: Please note that this *is* a sarcasm report. Here's an explanation of the chart. I've taken the net worth as seen in "B.100 Balance Sheet of Households and Nonprofit Organizations" and subtracted the state and local government debt and the federal government debt as seen in "L.1 Credit Market Debt Outstanding". I then adjusted that amount for inflation and population growth. 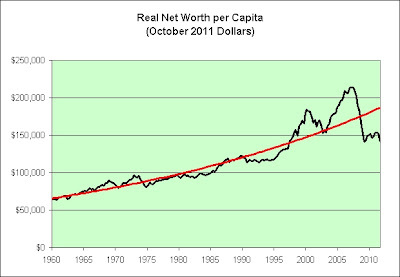 As seen in the red trend line, hello exponential trend failure. 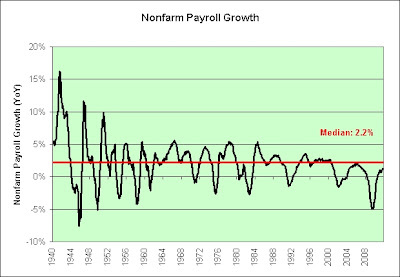 This chart shows the quarterly change as a percentage. 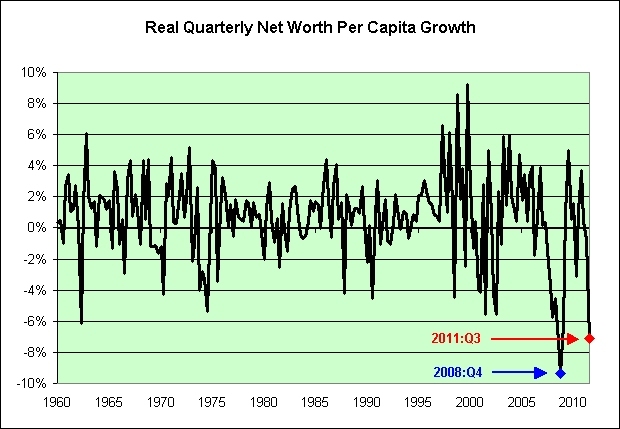 We were hit by inflation, a declining net worth, and increased government debt all at the same time. This wicked combination made the 3rd quarter of 2011 the 2nd worst quarter of the last 50 years. 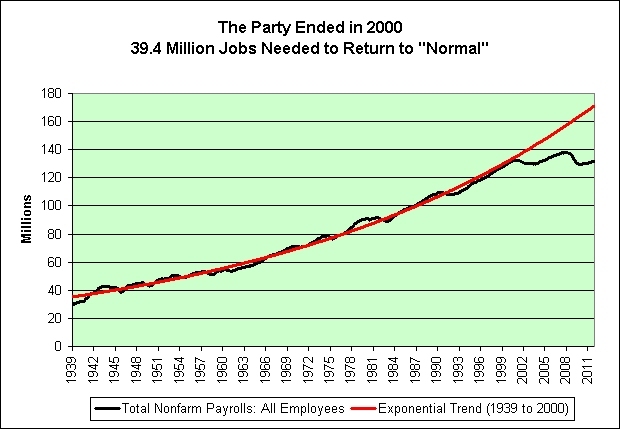 So much for that sustainable recovery theory. In my opinion, it is the best game of the decade so far. "Really, the recovery that's now 3 years old is just too young to die," Mirhaydari says.